I received this book as an Advance Reader Copy from Random House via NetGalley. The heartfelt but philosophical nature of Rainer Maria Rilke’s writing always stands out to me, but it stands out more so in this collection focused on grief. The book’s editor did an impressive job of both organizing the letters with helpful introductions and contextualizing them in a Preface that I recommend readers not gloss over. I am not new to Rilke’s work, having read several of his poetry and letter collections. But this book differentiates itself with its treatment of its theme. Grief is a universal experience and emotion yet one that many find difficult to articulate. And anyone familiar with Rilke knows that he is a master of relating complex thought and entreating readers with compassion and action. His letters, addressed over the years to loved ones, friends, and acquaintances alike, all demonstrate a genuine desire to help alleviate the pain of missing a loved one while also working deeper meanings and philosophies throughout. Each letter is personal, reflective, and in some ways rhetorical. He uses the recipient’s loss as a way to help him or her explore not just death but also the Self. Rilke distanced himself from religions and philosophies that emphasized reliance on higher Beings and preferred to explore ways of empowering individuals and taking ownership of one’s life and direction. While this may seem a bit out of place when trying to comfort people in a time of loss, his approach actually comes across unique and empowering. Rilke has a way of offering comfort in his letters even as he grapples with sadness and the practicalities and disparities of grief. Poignantly, he explains that when a person dies, we are left to carry on with their tasks and carry out their legacy. But why, he asks, do we perceive this to be a negative or a burden? For Rilke, the people who we truly loved are within us and that we can carry on their life as part of our own, taking on their unfinished work and exploring the things that they would have wished for us to become. Rilke uses the death of loved ones as a means to remind us that these moments can be sad and empowering at the same time. We have a cause to get behind, a legacy to carry on, a meaning that does not leave when the people we love leave us. The things and people that are part of our lives and influence us can never end since they move forward within us. His unique way of viewing this as an honor and something that helps to demonstrate the bond we had with the person is enlightening. Throughout the letters, the theme of self-empowerment during times of sadness, rather than letting death and grief cripple you, is paramount. Rilke focuses on facing grief head on, almost emphasizing it rather than shirking from it, so that we can use it to power us forward rather than letting it hold us back. In this way, we can learn from those who have left us and have the stamina to carry out their legacy. His admonishments are frank at times, encouraging people to grieve but to carry on with life and warning them that we cannot stop moving forward. There are risks to surrendering to grief instead of allowing it to teach us and help us grow. I recommend this book for readers who would like an introduction to Rilke, as it demonstrates the range of his writing without becoming overly philosophical or difficult to follow. Readers familiar with Rilke’s work will also enjoy a departure from his typical form. 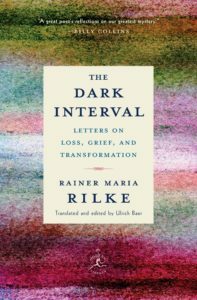 And if you have never heard of Rilke but are working through loss or know someone who is, then this book may help shed some new perspective on your sorrows and help you as you work through a difficult time.